Got Cabin Fever? Don’t Let the Winter Blues Cause You to Have Winter Weight Gain. I live in Memphis and for the past month or so we have gotten our fair share of the winter blues, snow, and ice. Want to blame someone. Blame the groundhog for seeing his shadow. Thanks a lot Punxsutawney Phil lol. The term snowapocalypse seems to be the running joke around here. The entire city shuts down with the hint of any snow and ice. We’re poorly prepared for it due to the limited amount of snow plows and salt trucks, people can’t drive in it, and the grocery store parking lot is packed like it’s the day after thanksgiving sale with people trying to stock up on bread, eggs, milk, comfort food, and processed snacks. Luckily, I live literally a minute away from the nearest grocery store if I run out of food or perishables for the week, but that rarely happens. Eating right and working out consistently is easily said than done. I know first hand how hard it is to stay on the healthy wagon. But once you have a clear sense of direction regarding your weight loss or maintenance goals, bad weather, feeling lazy and lethargic or being stuck in the house won’t let you lose sight of your goals. You have to plan to work and work your plan in order to stay on track and not fall into the gloom and doom of life. 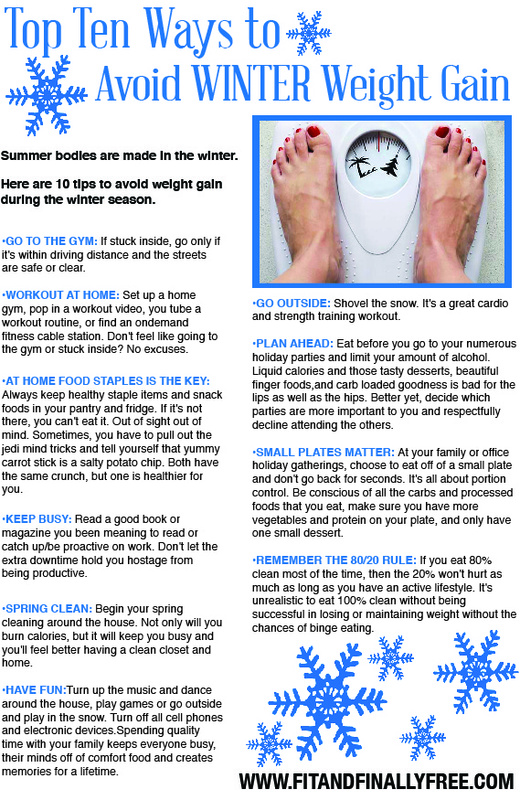 Here are my top ten ways to avoid weight gain during the winter season. I hope these 10 ways will help you towards obtaining your health and fitness goals, learn more about yourself, become better prepared and spend some quality time with your loved ones. Seasons change as do people and sometimes the goals we have set for ourselves. Don’t eat or rush through your season for you might miss out on life’s lessons as you are doomed to have to repeat it or lose the weight all over again. As you’re going through your winter season embrace it, gain wisdom in it, and lose the weight/deadweight from it. Live and be well. Previous postThe Race is Not Given to the Swift nor to the Strong, but to the One Who Endures to the End.